Keep inspiration close with this clever desktop reminder that your actions matter. Keep inspiration close with this clever desktop reminder that your actions matter. 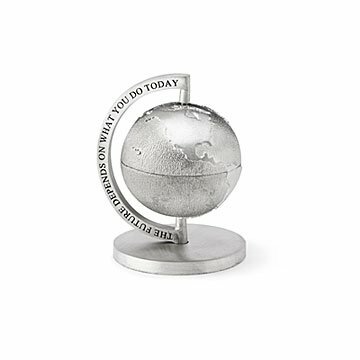 "The future depends on what you do today" is engraved around a miniature globe, crafted with textured details that stay true to our continents, oceans, and even equator. Give it a spin when you're feeling fidgety, then go turn that energy into something positive for your little corner of the world. Made in Lincoln, Rhode Island. 2 1/4" W x 3" H; 7 oz.